The Encore Networks EN-2000 is a high performance ultra-low cost M2M VPN network router designed for the Verizon Wireless LTE public and private networks. Ideally suited for the �Internet of Things� , this compact IP M2M router provides license free IP, VPN, Firewall, Ethernet and IP interworking with an embedded Verizon LTE cell module. Servicing the needs of mission critical business and enterprise applications providing 24/7 x 365 connectivity. The EN-2000 supports high-availability in fixed or portable locations supporting such verticals as: Remote Monitoring, Video/Alarm Panel Surveillance, Finance e.g. ATMs, branch back up/Business Continuity, and Enterprise support. 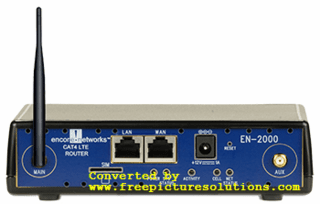 The EN-2000 M2M router supports traditional broadband and cellular data networks including DSL, cable, and Ethernet. Disaster recovery and business-continuity failover/failback are standard. When programmed for failover, the EN-2000 detects network failures and seamlessly switches to LTE or WAN programmed � keeping the network online. In support of these features the EN-2000 M2M router provides multiple VPN tunnels and VLAN support. The EN-2000 M2M router enables quick Business Continuity/ Disaster Recovery implementation with existing 3rd party routers using standards based VRRP which enables Automatic Failover and Failback without the need for IT personnel involvement. Upon a link failure, traffic moves automatically to a working link, or to a new connection as programmed. The license-free embedded router software can be set up to broadcast to multiple operation centers with traffic shaping ensuring maximum performance, while reporting alarms to a NOC.